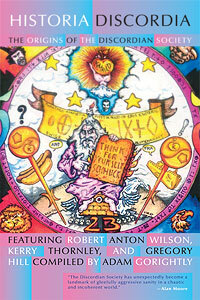 The most extensive collection in print documenting the Discordian Society’s wild and wooly legacy, Historia Discordia: The Origins of the Discordian Society (Amazon) features the unique worldview and wit of such illuminated iconoclasts as Robert Anton Wilson and Discordian founders Greg Hill and Kerry Thornley. Chronicling Discordianism’s halcyon days, Historia Discordia presents a fun and freewheeling romp through rare photos, holy tracts, art collages, and fnords, many of which appear for the first time in print. Kerry Thornley never imagined that after starting a spoof religion in the 1950s dedicated to the worship Eris—the Greek Goddess of Chaos and Discord—that such an irreverent yet light-hearted endeavor would unleash, in the years to come, a torrent of actual chaos into his life and turn his world upside down. In 1959, Thornley served in the Marines with Lee Harvey Oswald and was actually writing a novel based on Oswald three years before JFK’s assassination. These connections would later cause New Orleans District Attorney Jim Garrison to suspect that Thornley was one of the notorious Oswald doubles and part of a JFK assassination plot. 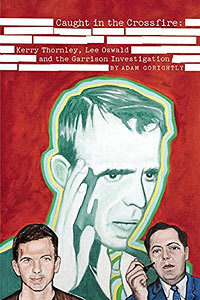 Initially, Thornley denied these allegations, but later came to believe that he’d been used as an unwitting pawn in a conspiracy that ran far deeper than the JFK assassination and may also have included the RFK and MLK assassinations, as well as the disturbing specter of government sponsored mind control. One of the 1960s counterculture’s most fascinating characters was Kerry Wendell Thornley — a writer, philosopher, Zen dishwasher, enlightened prankster, and, possibly, an Oswald double with disturbing ties to the Kennedy assassination. A lifelong provocateur, Thornley was linked to many of the fringe elements of the time. He helped create the spoof religion called the Discordian Society and its tract, the Principia Discordia. He coined the term “paganism” to describe various nature religions. And he befriended Robert Anton Wilson, inspired the Illuminatus!, and gave his anarchic support to the Bavarian Illuminati, a brilliant prank. Chasing Eris by Brenton Clutterbuck. What happens when you start a religion with no rules, no dogma, no boundaries, and put everyone in charge? Chasing Eris explores the wild, untamable beast that Discordianism has become: from the old-time Discordians who rode the First Fnord Wave, to beyond the realms of the Chaos Magicians of Brazil, drinking-it-down with the irreverent pagans of Helsinki, meeting Chaos-slingers of the Thelemites of Texas, to the clockwork consistency of Germany’s anarchists. Hail Eris! Chasing Eris is an expansive exploration of the Modern Day Manifestations of Discordianism and the Discordian Popes around this world who keep Eris fnording.